Yarn Type A beautiful fine cotton, linen and viscose blended yarn has a lovely draping. 55% viscose, 33% cotton, 12% linen. (per ball) Approximately 135 metres (148 yards) per 50g ball. Hand wash cold. 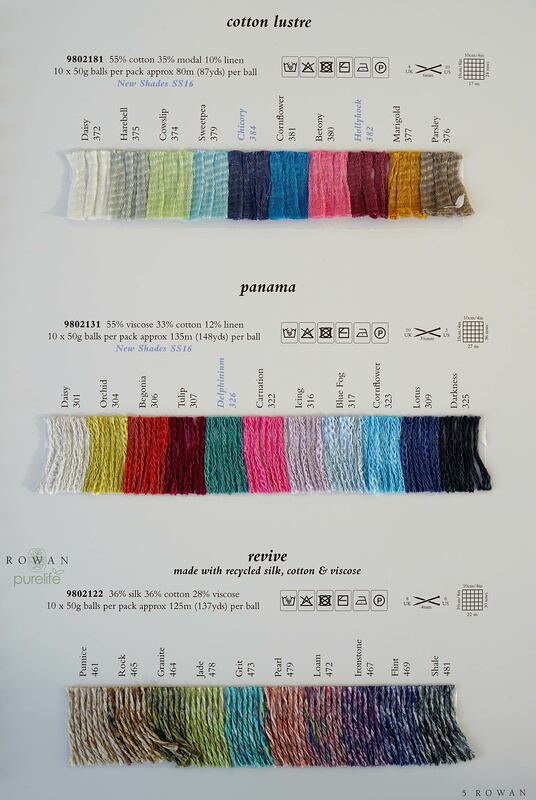 8 designs for women by Sarah Hatton using Rowan Panama. Featuring 7 garments and 1 simple shawl which make the most of the beautiful draping quality of the Panama yarn.These designs make the most of Panama's beautiful draping quality, from classic summer tops and cardigans to more unusual fluid shapes. A Rowan collection featuring 15 designs for women by Marie Wallin, Grace Melville and Lisa Richardson using Rowan Panama. Crochet this womens openwork and textured cropped sweater, the members monthly exclusive free pattern for August 2012. Designed by Marie Wallin and using the gorgeous yarn Panama (viscose, cotton and linen). With wide round neck, cute cap sleeve detail and a beautiful lace crochet stitch pattern, this crochet pattern is for the intermediate knitter. Knit this ladies pretty, round neck tunic, the member's exclusive monthly free pattern for April 2014. Designed by Lisa Richardson using this lovely combination of yarns; Panama, Kidsilk Haze and Fine Lace, the lace design is worked in stripe sequence to give this stunning effect. This cute ladies top uses Panama with Anchor Artiste Metallic (originally Shimmer) embellishments and was the members exclusive pattern for March 2011. This Web Exclusive design from Rowan Studio 23 - follows the same fresh and clean resort look as the rest of the Studio 23 collection. Knitted in two contrasting colours of Rowan Panama this is an easy to wear relaxed style cardigan.